London, 11 February 2019: – With just eleven months until the EU’s self-imposed deadline to end overfishing, the Our Fish campaign today called on EU fisheries ministers to stop acting on behalf of a few industry short-term profits, and start delivering sustainable fisheries for all EU citizens, following today’s release of a New Economics Foundation report that demonstrates that EU member states will be fishing an enormous 312,000 tonnes above scientific advice for NorthEast Atlantic fish stocks in 2019. Sweden – represented by minister, Sven-Erik Bucht, tops this year’s overfishing league table with 52.4 percent of its Atlantic quota outside scientific advice, followed by the UK (John Gardiner) at 24.3% and Ireland (Michael Creed) at 21.7%. In terms of tonnes, the UK is the worst culprit, with plans to take 106,925 tonnes more than is scientifically recommended, more than double the planned overfishing of 2nd-placed Denmark, with 49,914 tonnes . 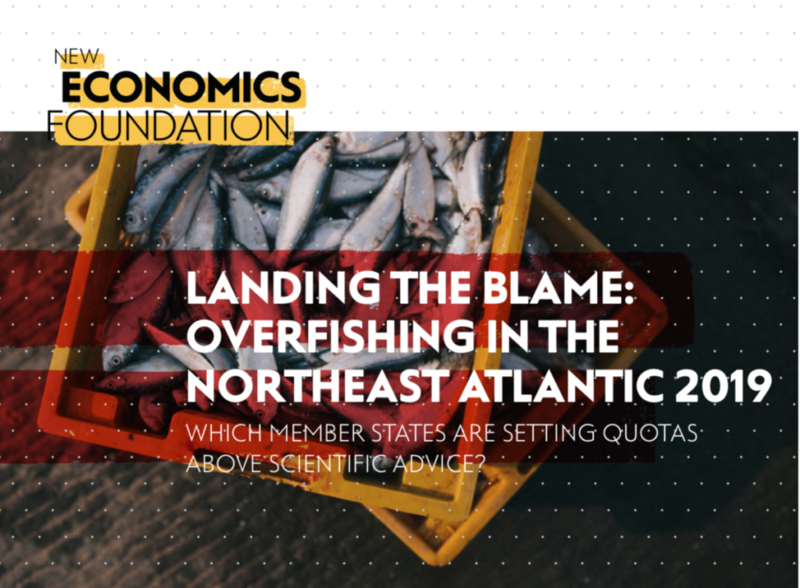 The New Economics Foundation produces the Landing the Blame report annually, following the setting of fishing limits for the Baltic and Atlantic, to analyse whether Total Allowable Catches (TACs) have been set above scientific advice, and which EU member states benefit most from these TACs. Fishing limits for the North Sea and Atlantic are set during AGRIFISH Council meetings in December, and despite repeated requests from civil society, are not open to the public or live-streamed. This lack of transparency makes it difficult to say who is most responsible for perpetuating overfishing, however the results clearly demonstrate who benefits most. “Instead of making serious progress to ending overfishing by the 2020 deadline, EU Fisheries Ministers actually increased the level of overfishing of North-East Atlantic fish stocks for 2019 by almost 10% on average above 2018 levels. Fisheries Ministers continue to pile up the pressure and the costs of overfishing, instead of taking both scientific advice – and the benefits it can deliver for the ocean and our communities – seriously. “Ending overfishing is the clearest, simplest thing fisheries ministers can do to help restore ocean health – and every day EU ministers waste, decreases the chance for environmental, economic and social benefits in the future. We urgently need real political leadership to end this damaging cycle in 2019,” concluded Hubbard. “If we allow fish populations to recover from overfishing they will increase in size and after only a couple fishing seasons produce much greater catches”, said Landing the Blame author Griffin Carpenter, Senior Researcher at the New Economics Foundation. Landing the Blame reports that Denmark has risen to 4th position in the league table of Member States with the highest percentage of their TAC in excess of scientific advice. According to the report, for the 2019 Atlantic TACs, Fisheries Minister Eva Kjer Hansen was involved with TAC decisions that allow fishing at 19.7% above levels that scientists have determined to be consistent with the sustainable management of European fish stocks – almost four times higher than last year (5.6%). Denmark has also received the second largest TAC increases above scientific advice in terms of tonnes (49,914 tonnes excess TAC), only preceded by the UK, and is therefore one of the top countries responsible for impeding the transition to sustainable fisheries in the EU. Germany has risen from 6th to 5th position in the Overfishing League of Member States. According to the report, State Secretary for Fisheries Hermann Onko Aeikens was involved with TAC decisions that allow fishing at 18% above levels that scientists have determined to be consistent with the sustainable management of European fish stocks – a rate more than three times higher than for 2018 (5.9%), and equivalent to 20,620 tonnes of excess TAC above scientific advice. Ireland has dropped from 1st place to 3rd place in the Overfishing League according to NEF, however the level of overfishing has actually increased to 21.7% of excess TAC (17.8%). Ireland has this year received 34,052 tonnes above scientific advice, compared to 31,127 tonnes last year. Mike Walker, Our Fish representative in Ireland said “Last December Michael Creed celebrated the outcome of the December Council as being worth €260 million, to “support the livelihoods of fishermen” in Ireland, but did he calculate the cost of past and continued overfishing? Has he considered the cost of a sustained attack on a priceless natural resource, devastating the marine environment and the communities who rely upon it? What about the livelihoods and communities which used to populate the Irish coast, but who have been lost along with the fish stocks – because of overfishing. Ending overfishing takes both political courage and vision. Ending overfishing is the only way Michael Creed can truly act in the interests of coastal livelihoods, and the environment.” . Netherlands has dropped from 4th to 6th position in the league table of Member States with the highest percentage of their TAC in excess of scientific advice. According to the report, for the 2019 Atlantic TACs, Fisheries Minister Carola Schouten was involved with TAC decisions that allow fishing at 13.5% above levels that scientists have determined to be consistent with the sustainable management of European fish stocks, however this is still an increase from 7.5% for 2018 TACs. Netherlands is also 4th in terms of the total tonnage of TAC set above advice, receiving 31,910 tonnes excess TAC above scientific advice (an increase from 22,104 tonnes in 2018). “The Netherlands has already known for five years that the deadline to end overfishing was coming in 2020. This result shows that bold steps are still needed from the Dutch minister to meet the deadline” says Sharon Becker, Campaign Coordinator of Our Fish Netherlands, “for many fish species in the Dutch North Sea a solution is required within this year”. In an embarrassing move for Sweden, it has been rated as the worst EU nation to benefit from overfishing in the Atlantic in the Landing the Blame report. According to the report, Sweden has gone from 9th to 1st place in the league table of Member States with over 52.4% of their TAC in excess of scientific advice – equivalent to 17,369 tonnes – due mainly to herring, whiting, mackerel and blue ling in the Skagerrak and Kattegat. “This is an embarrassing position for Swedish Fisheries Minister Sven-Erik Bucht – to have over half of their fishing TAC in the North East Atlantic above scientific advice for sustainable fishing limits in 2019 – going from 9th to 1st place in just one year – is deeply concerning. This year Sweden is going to have to work hard to demonstrate its commitment to sustainable fisheries management by strongly supporting fishing limits in line with scientific advice and stronger monitoring and control of its fleet,” said Hubbard. The UK has maintained its position as the second worst overfishing nation in the EU, with the highest percentage of their TAC in excess of scientific advice for Atlantic fish stocks (24.3%), however it the equivalent volume in tonnes has increased by over 30,000 tonnes to 106,925 tonnes above scientific advice. “While Brexit makes all things fishy between the EU and the UK at the moment – one thing is clear – the UK is showing no signs of dropping its addiction to overfishing and continues to flout the interests of UK citizens who are the public owners of this precious resource. Whenever the UK stops working within the EU common fisheries policy – they must deliver a much stronger commitment to following sound scientific advice for sustainable fisheries management, or we will continue to see disastrous economic, social and environmental effects of overfishing,” said Hubbard.